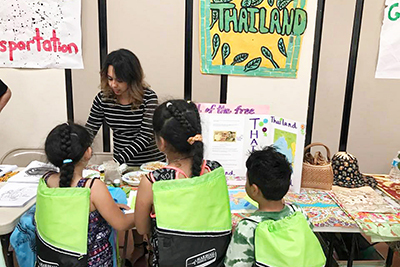 At Placerville Union School District’s (PUSD) annual Multi-Cultural Night in April, the multipurpose room at Schnell School was transformed into an international gathering that greeted several hundred students, educators, families, and community members. The walls were lined with 16 booths that represented countries like Thailand, Germany, Guatemala, and more. Students took passports from table to table to learn interesting information about that particular country, view artwork, instruments, and even taste native snacks. Attendees could also purchase Mexican dishes like tacos, nachos, and burritos for a mere $2. Students experienced various facets of each country, as they walked around the room with their families. Erica Briseno is a district parent and hosted the booth for Thailand. As students eagerly read facts on display boards and tasted a variety of snack foods, Erica engaged them with a quiz on the country’s official language and currency. Guatemala’s booth was hosted by a District family, where several different generations displayed artwork for students to explore. Sixth-degree black belt and owner of Cameron Park and Foothill Taekwondo, Bob Westphal, has a grandson who attends PUSD and hosted the booth for Korea. “This event is a nice way to introduce students to different countries and cultures. It’s a nice way for them to become exposed to other places,” Bob noted. For more information about PUSD and their schools.